There are nine major reasons that EVs are a great fit for Oregon. These reasons include population clustering, vast charging infrastructure, abundant clean energy, nearby fun places to travel, a public and private sector that have shared goals, battery-friendly weather, and an optimistic pioneering green minded consumer base. 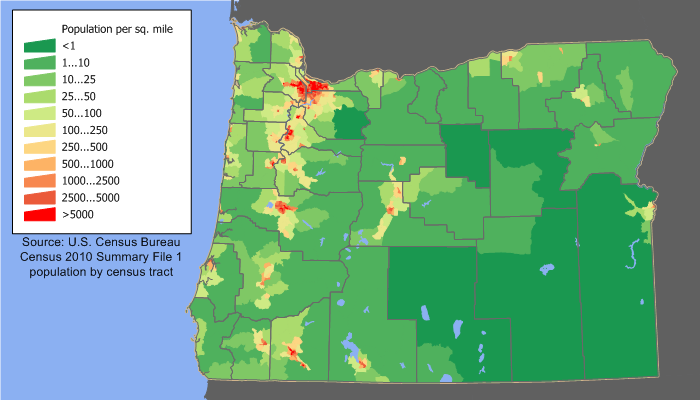 Reason 1: The 100 Mile Corridor - The bulk of Oregon's population is clustered along the northern 100 miles of Interstate 5. This allows most trips within the state to be well within an EV's range. Reason 2: Infrastructure - Oregon was an early mover in EV charging station installations, including DC fast chargers. This infrastructure allows EVs to be used in more than just the half-a-charge radius around their nightly charging location and alleviates fears of being stranded with nowhere to plug-in. Reason 3: Abundant clean electricity - 85% of Oregon's electricity is renewably generated. The electric utilities here are happy to see EVs on the road that use their product and create an increased demand predominantly at off-peak times. 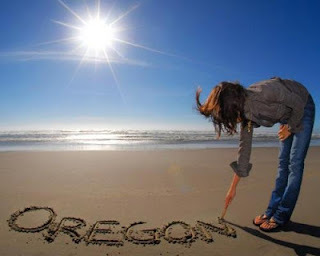 Reason 4: Staycation destinations - Mt Hood, the Pacific coast, Columbia River Gorge, Forest Park, covered bridge tours in Cottage Grove, cherry blossom tours, scenic river byways, the Oregon Dunes, beer and wine tours and much more are all within the range of an EV in NW Oregon. Reason 5: Pioneering Spirit - Oregon is known for trailblazing. Adopting the new technology of plug-in transportation is not daunting for the high-tech pioneering folks of Oregon. Reason 6: Battery-Friendly Weather - A typical year in NW Oregon has very few days that are below freezing and even fewer days that are over 100°F. This makes the region's climate great for maintaining EV battery range and capacity. Reason 7: Economy - Oregon has zero oil wells and zero oil refineries. This means that the bulk of every dollar spent on gasoline here leaves the state. Electricity, on the other hand, is generated locally and fueling money spent on it stay local. More than 300 EV related firms in Oregon have created nearly 1600 jobs in the state. Reason 8: Cooperation - Oregon's business community, state & local governments, environmental community, and utilities all see EVs as a path to a better, more prosperous state. Reason 9: Eco Ethos - Oregon has more than its fair share of treehuggers. While you don't need to be a granola cruncher to drive an EV, this green enthusiastic base has created a market for eco-friendly cars in the region. The unique combination of factors listed above has created a supportive EV-friendly environment in Oregon. Regions that adopt technologies early and create demand attract business clusters. While people in every state are interested in energy efficient products, Oregon's fanaticism has positioned her well to seize EVs. As Entrepreneur Magazine put it, Oregon is where capitalism meets eco-consciousness. Here it is not a one or the other choice. Eco-friendly products are what a majority of people want and what regional businesses have to provide to be successful. 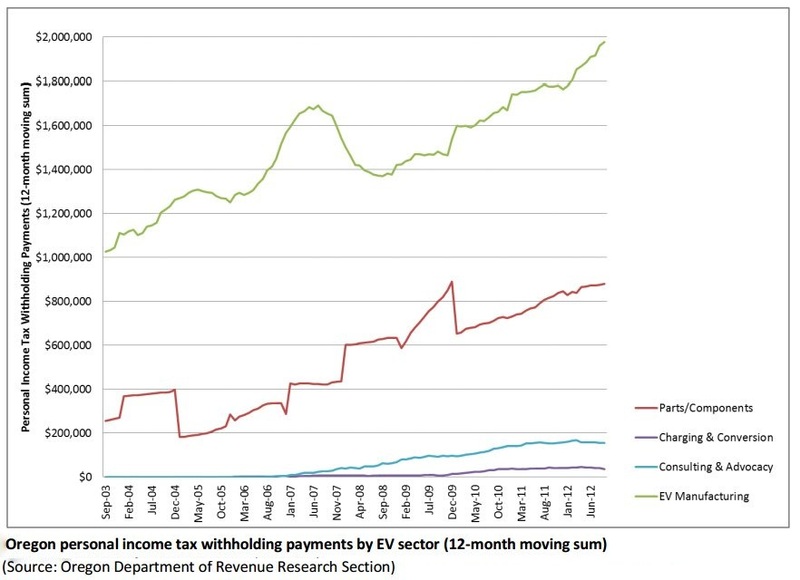 You may be tempted to pick out one of these as THE reason that EVs are so successful here. I posit to you that it is not any one of these reasons that makes EVs popular in Oregon. It is, in fact, the combination of all of them that has made EVs a great fit for Oregon. ..."it takes millions of years to refuel your [gas] car. That's right: millions and more likely, tens of millions of years. In fact, no one knows exactly how long, but it's a very long, long, long time. The best guess is the process started sometime around the Cretaceous period, 100 million years ago. Back in 2010, the New York Times ran an article entitled, "Tracing Oil Reserves to Their Tiny Origins." There's a reason by most of the world's oil fields are found either in basins once formed by ancient seas or still buried deep below today's Arabian Sea or Gulf of Mexico." Oregon is known for its green trees and green mindset. There is an overwhelming green ethos among many residents of our Ecotopia. Having lived here all of my life, I don't really notice it until I leave the state. Here, in Oregon, next to nearly every trash can, there is a recycle container. Curbside pickup of recycling and yard debris are common. Oregon has a long list of eco-friendly awards and accomplishments. Oregon was the first state to have a bottle bill. All of Oregon's beaches are public and there are multiple beach clean-up drives each year. Farmers markets are common here, allowing for local food production and consumption. Portland and Eugene have earned multiple bicycle-friendly city awards, including being awarded platinum status by the League of American Bicyclists. In 1993, Portland became the first US city to adopt a global warming action plan. Hillsboro Oregon is a finalist in the national Mayors' Challenge for sustainable solutions for cities. In 1987, Portland adopted its first recycling system. Twenty five years later, Portlanders recycle 63% of their waste, one of the highest rates in the US. Entrepreneur Magazine ranked Eugene #1 for "Top Towns for Green Scenes: Where Capitalism meets eco-consciousness". With all of this and more, Oregon is often ranked number 1 or 2 in lists of the greenest states. Portland ranked #1 and Eugene #5 on Mother Nature Network 2012 Top Ten Green U.S. Cities. Given this green backdrop, it is not surprising that new eco-friendly technologies are often adopted here. Portland has ranked #1 per capita in hybrid ownership since 2005 and has ranked #1 in voluntary renewable power purchasers in the country since 2009. It is easy to imagine a Portlandia skit where a salesman mentions that a product is environmentally friendly and it is sold before he can even mention any of the other features. Oregon also has the "Silicon Forest". This skilled labor force works at Intel, Tektronix, Maxim and others. This also includes North America's largest solar panel manufacturing plant for Solar World. Oregon’s high tech workforce quickly became a clean tech workforce when coupled with green public policies and incentives. There is a general sense of optimism here that we can help make the world a better place. In 2012 Oregon ranked number one in the nation in charging stations per capita in the Clean Energy Leadership Index. At that time Oregon had more than twice as many EV charging stations per capita than Michigan or California. The report asserts that Oregon’s high ranking was “largely due to unwavering consumer-driven demand for clean-tech products and services”. See all 9 Reasons EVs Are Great In Oregon. The book All I Really Need to Know I Learned in Kindergarten discusses how much better the world would be if adults followed the basic rules taught to children. It turns out that this applies to creating an EV-friendly state too. 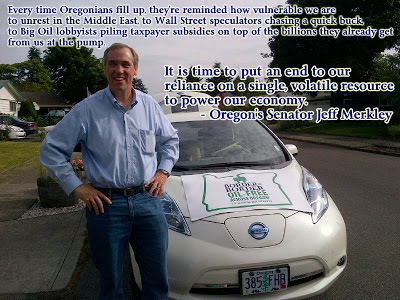 In 2010, an EV activist from California came to Oregon to speak at a local EV event. He was surprised at our relationship with the electric utilities, the city, and state government agencies. I asked what he meant. Our event was at Pioneer Courthouse Square and it was sponsored by several local businesses, the City of Portland, and the local utility, Portland General Electric (PGE). He said that they were usually at odds with the city or county about EV parking or infrastructure. And that many of the California utilities were worried that EVs would be a load on an already burdened grid. Things are very different here in Oregon. We have several cotravelers, these include our utilities, the Clean Cities Coalition, Dept. of Transportation, Citizens Utility Board, Sierra Club, Oregon Business Organizations, Senator Merkley and others. Our utility is not worried that EVs will crash the grid. In fact, they welcome EV because there's surplus capacity, especially at night. EVs will generally be charged overnight, thereby reducing the disparity between daytime and nighttime demand. This will help stabilize the grid. The CEO of Portland General Electric (PGE) even drives a Chevy Volt. As mentioned previously in the Infrastructure section, PGE installed the first public DC Fast Charger in the nation. The Oregon Department of Transportation (ODOT) has fully embraced EVs. We covered much of ODOT's support in the earlier section on Infrastructure. They have applied for and received multiple federal grants to install EV charging infrastructure. You can see an album of the West Coast Electric Highway here. This brought construction jobs to the state. Regional politicians have thrown in their support for EVs too. Portland Mayor Sam Adams, Oregon House of Representatives member Mary Nolan, Senator Jeff Merkley, and Multnomah County Chair Jeff Cogen have all spoke at events in support of EVs. The Governor has even attended ribbon cuttings for charging stations. In 2012, to celebrate Independence Day, Senator Merkley (pictured above) rented an EV at the Portland airport and drove from the northern border of the state to the southern border along the West Coast Electric Highway. At each stop, he spoke to local crowds about energy independence and the benefits of EVs. The list of organizations in the state that support EVs includes several Oregon EV businesses including Arcimoto, Brammo, Green Lite, MotoCzysz, Shorepower, and others. Drive Oregon is a business cluster of companies promoting EVs within the state. Travel Oregon is supporting EVs too. As mentioned in the Staycation section, they are creating EV travel itineraries based around charging stations. The Citizens Utility Board (CUB) is a consumer advocacy group and utility watchdog. They promote the environmental benefits and fuel savings of electric vehicles and discuss this at several events each year. There are two non-profits worth mentioning for their EV-advocacy. They are Solar Oregon and the Oregon Electric Vehicle Association. Both groups actively promote electric vehicles and renewable energy. The Oregon Transportation Research and Education Consortium (OTREC) has been awarded a $2.1 million grant by Metro. OTREC will use the grant to promote the use of electric bicycles and improve air quality and community health. Oregon governor, John Kitzhaber, convened the 10 Year Energy Plan Task Force to draft the state’s 10-Year Energy Action Plan. It focuses on three core strategies: increasing energy efficiency and conservation, enhancing clean energy infrastructure, and promoting clean transportation. These strategies call for action to accelerate the development and deployment of electric vehicles through electric grid modernization and increased funding for the Oregon Innovation Council. Even seemingly little things are helpful in making Oregon EV-friendly. In 2008, the Oregon Building Codes Division established statewide EV charging station permitting and inspection standards. This meant that each county did not have to create their own process, electricians didn't have to the nuances of each counties paperwork. These installations were also put on the same-day permit schedule called the Minor Label. Oregon's statewide process speeds simple installations by enabling licensed electricians to pre-purchase permitting minor installation “labels” online and inspections are only required on 1 out of 10 installations. 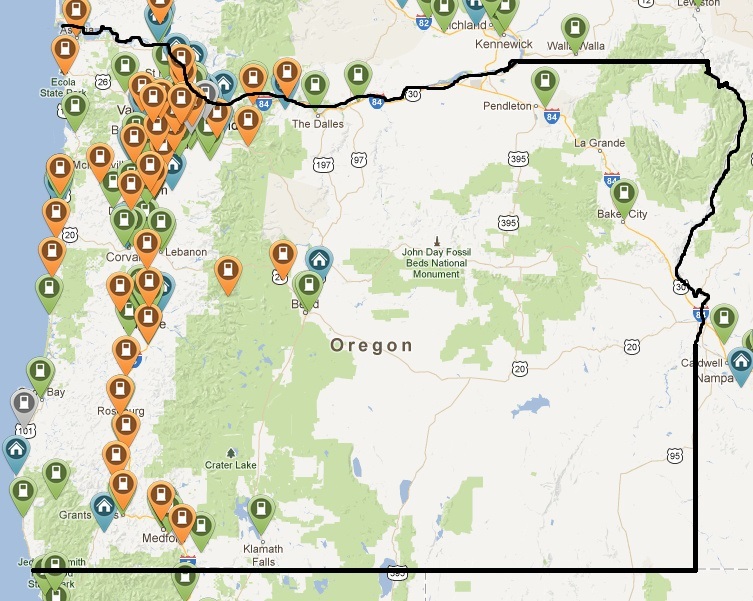 Oregon deemed 40 amp charging installations as simple projects that required no special process. Clean Cities examined the methods of several regions around the country and deemed Oregon's as the best practice. It reduces the inspection cost to the state and to the permitting cost to EV owner. This made the installation of at-home charging infrastructure that much more accessible. Each Oregon minor label permit costs $14, compared to permitting costs up to $700 in some areas of Los Angeles. Oregon's EV community has steadily grown due to the clustering of support found here. Companies and the community benefit. 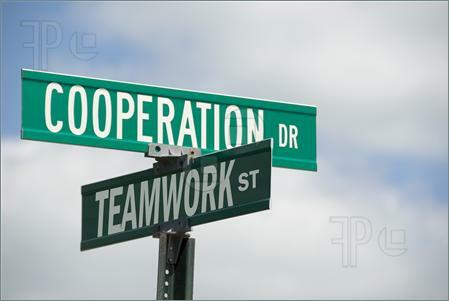 Oregon's state and local governments, private businesses, business organizations, utilities, advocacy groups and others work as a team. They all see EVs as a means to improving the quality of life here. This is one factor that helps put Oregon's EV adoption rate ahead of the national average. Oregon has zero oil wells and zero oil refineries. This means that the bulk of every dollar spent on gasoline here leaves the state. 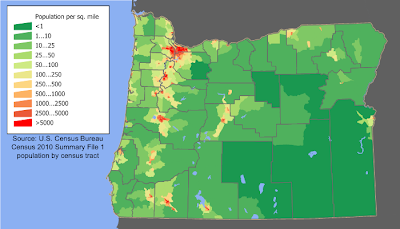 There are about 3.9 million people in Oregon and a similar number of vehicles. Collectively, we Oregonians currently consume about 1.5 billion gallons of gas annually at a cost of about 5.5 billion dollars a year. How much better would our local economy be if that $5+ billion stayed here? It has been estimated that a dollar spent locally circulates on average between 6 and 15 times before it leaves a region and creates between $5 and $14 in value. This means that the state's economy could be boosted by more than $30 billion if money currently spent on fuel were to be spent locally instead. Capturing even a small part of this can have great impact. Electric vehicles send "fueling" money to the local utility rather than to an out-of-state multinational corporation. Money spent locally will mean more local jobs and more resources to develop the region's renewable energy portfolio. Toward this end, in 2011, the Oregon Innovation Council made a significant investment in the state's EV industry by funding a group called Drive Oregon to accelerate EV industry growth within the state. Oregon now has a growing industry consisting of raw material providers, parts & components suppliers, supply chain management, software, engineering & design firms, power electronics, battery management, charging infrastructure manufacturers & installers, vehicle conversions, and ancillary organizations that support the core EV industry. Oregon now has over 300 firms with at least part of their revenue coming from the EV industry. Drive Oregon's data shows that the EV industry continued to grow during the Great Recession, while other transportation industries suffered enormous losses. It further estimates that the economic activity from Oregon's EV industry created 1,169 jobs, had a total value added of nearly $148 million, generated gross economic activity of $266 million, and provided over $89 million in total employee compensation. The Northwest Economic Research Center (NERC) estimates that this had a total impact of 1,579 jobs. In addition to the increase in economic activity, the industry also generates significant tax revenue for the state and federal governments. NERC estimates total state and local tax revenue of $11.9 million and federal taxes of $20.8 million. To put it simply, the oil undustry removes money from our region and weakens our economy; whereas, EV adoption means that fueling funds stay local and the EV industry creates jobs and economic growth. “It’s good for the industry and it’s good for your pocketbook,” said Michael Kintner-Meyer, an engineer at Pacific Northwest National Laboratory. Modern EV batteries do best in temperature ranges that are not too different from those that we humans prefer. Cold weather can reduce an EVs range and excessive heat can damage the battery and reduce its capacity. EV manufacturers can include active thermal management to avoid battery damage, but heating or cooling takes energy, thereby giving you less energy for propulsion. Here in the NW part of Oregon we have very few days that are below freezing and even fewer days that are over 100°F. 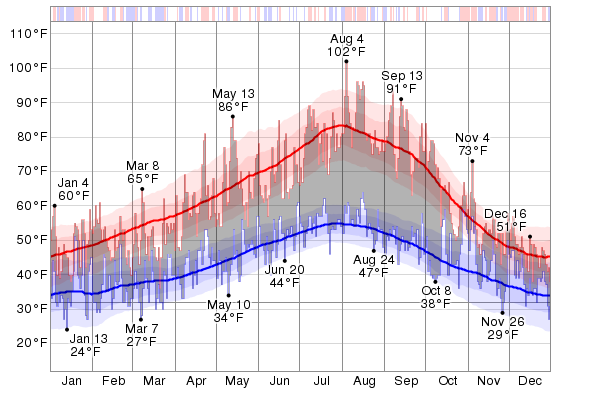 Below is a chart of 2012 temperatures from Salem Oregon. The above graph shows the daily low in blue and the high in red. The thick lines show running averages. The hottest day of 2012 was August 4, with a peak high temperature of 102°F. The hottest month of 2012 was August with an average daily high temperature of only 84°F. The coldest day of 2012 was January 13, with a low temperature of 24°F. The coldest month of 2012 was January with an average daily low that, at 34°F, remained above freezing. This temperature range makes Oregon ideal for EV batteries. There are very few days that thermal management is needed, meaning that batteries generally have long and happy lives here and the bulk of their energy can be used for getting you where you need to go. One final note about our weather. ECOtality's Blink charging stations suffered reliability problems throughout 2011 and 2012. Despite having charging stations deployed in 5 states (and later expanding to 7), over half of their problem reports during this first 2 year period came from Oregon. The charging systems here were one, being used used, and two, being damaged by rain. Being the passionate EVs drivers that we are here, we let ECOtality know when something was broken. ECOtality has continued to analyze the failures and improve their product. In a recent presentation to the Oregon Electric Vehicle Association, they told us that placing stations here was the best way to ruggedize them for the rest of the country. The consistent feedback from Oregon EV drivers allowed them to listen, respond, and adapt, eventually leading to a highly reliable product. Oregon is known for trailblazing. In this part of our discussion of Why EVs Are a Great Fit For Oregon we'll look at the Pioneering Spirit that leads Oregonians to embrace this new technology. In the 1800s, Oregon welcomed stagecoaches filled with weary travelers to places like The Wolf Creek Inn. On March 16, 2012, I arrived with a group of rain-soaked travelers to that same inn. This time, it was with a group of EV drivers traveling on Interstate 5's new West Coast Electric Highway. Whether it is adopting a new technology or blazing a trail over the Cascades, Oregonians are not known for embracing the status quo. We are not afraid to do things in a different manner. The pioneering spirit that brought people to Oregon is now helping to pioneer a new method of transportation. 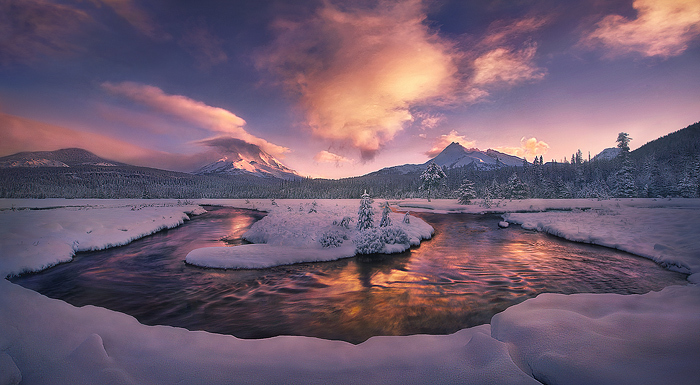 From Portland, it is about 80 miles to the beach and about 65 miles to Mt Hood. 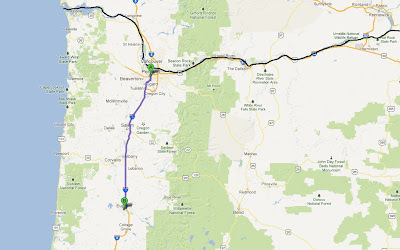 From the "100 mile corridor" mentioned in Part 1, there are many fun and interesting places well within the range of EVs such as the Nissan Leaf. 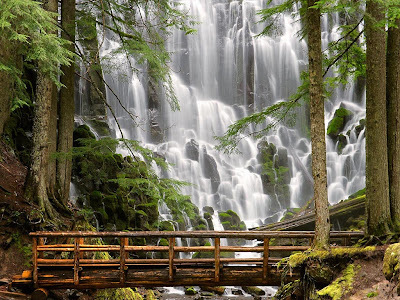 Destinations include the Columbia River Gorge, Forest Park, covered bridge tours in Cottage Grove, cherry blossom tours, scenic river byways, the Oregon Dunes, beer and wine tours ... the list goes on and on. Travel Oregon has put together lists of scenic byways and itineraries for day-trip loops, including biking, hiking, and wine or beer tours. These itineraries can be strung together to make as long or short of a regional getaway as you'd like. Many of these trips are possible in an EV. The fast charge infrastructure discussed in part 2 opens up even more destinations. I have written about my EV trip to Spirit Mountain using their fast charger and the one in Newberg. More recently my family and I went to the Wooden Shoe Tulip Festival using the Woodburn OR fast charger. Electricity is cheap here in Oregon. Electricity is generally about 10 cents per kilowatt-hour (kWh) and it is usually on a flat rate, so you don't have to worry about peak times. If you opt-in for a time-of-use program, you can pay less than 5 cents per kWh during off-peak times. 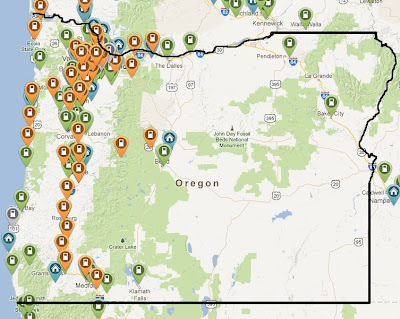 Oregon has 21 hydroelectric power plants. Most of them are on the Columbia River watershed. The Columbia River Gorge is also a growing source of wind power for the state. Shepherds Flat Wind Farm in Oregon is one of the largest wind farms in the world and began operation in September 2012. It is generating up to 845 megawatts of electricity, enough to power 235,000 U.S. homes. The Shepherds Flat Wind Farm was brought online late in 2012, so we'll see even more wind power in 2013. Oregon has just one coal-fired power plant, in the city of Boardman, and it is scheduled for shutdown in 2020. If Portland General Electric wanted to keep it open longer, the plant would need $500 million of pollution control upgrades by 2017 to comply with clean air standards. Instead, it is cheaper to expand nearby wind energy projects and the natural gas generation already at the Boardman site. So as green as Oregon's grid is already, it will continue to get cleaner. EVs don't have any direct emissions; however, the electricity source used to charge them can. The Union of Concerned Scientists conducted a study to look at the emissions related to EV driving compared to conventional cars. They found that even on the worst electricity grids in the US, EVs generate less emissions than the average gas car and that in nearly half the country, EVs generate less emissions than a hybrid. 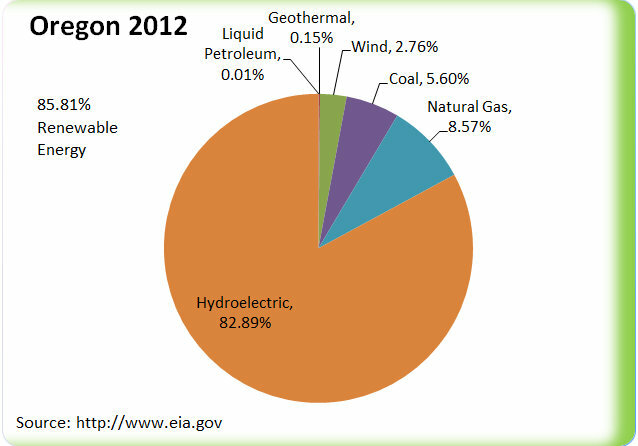 Oregon, with our our mostly clean electricity generation sources, was one of the many states in this best category. Additionally, as I have discussed in other articles, EVs represent a potentially tunable demand load and energy storage system. These attributes mean that the presence of EVs can will help the local grid better adapt to intermittent energy sources such wind. 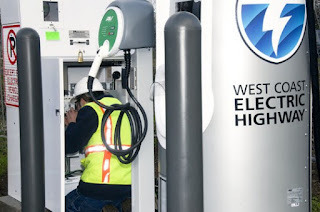 In 2010, Portland General Electric installed North America's first public DC Fast Charger (DCFC). By 2012, the makers of PlugShare said that Portland had more EV infrastructure per capita than any other US city. With 48 DCFC stations online today, Oregon currently has more fast charge infrastructure than any other state in the country. California (a much larger state) is 2nd with 39 DCFC stations. Oregon's quest for infrastructure began in 2008 when a fleet manager called the Oregon Department of Transportation (ODOT) and complained about gasoline prices and just happened to get transferred to the Office of Innovative Partnerships. 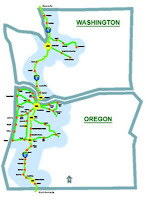 Oregon was selected by The American Recovery and Reinvestment Act to have 8 DCFC stations installed in Southern Oregon. Oregon was also selected for "The EV Project", a DOE public/private project to install residential and public charging stations (both Level 2 and DCFC) initially in 5 states. 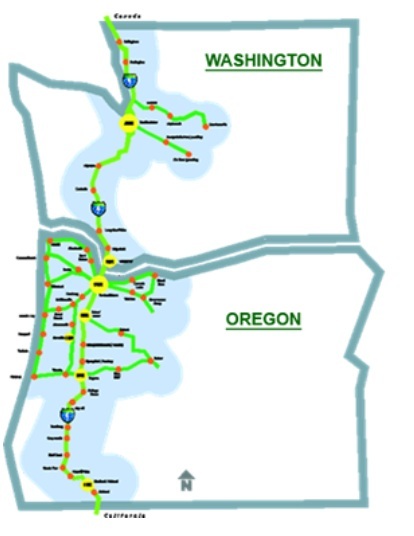 ODOT is also running Oregon's portion of the West Coast Electric Highway project. This is funded by a US DOT Transportation Investment Generating Economic Recovery (Tiger) II Grant. This grant funded 33 DCFC stations throughout Oregon, along key corridors such as Oregon’s coast, I-5, and the Columbia Gorge. The ODOT was frugal with the Tiger funds and came in under budget. This allowed them to fund an additional 11 DCFC stations that are currently being planned for installation in the summer of 2013. And there are other infrastructure projects. 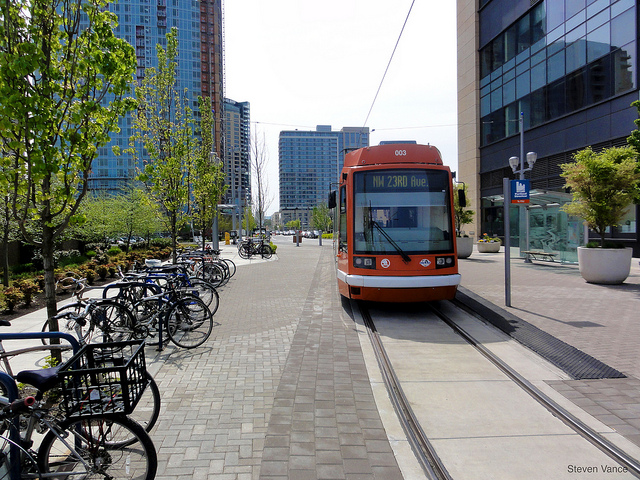 Portland State is running a research project called Electric Avenue. This project turned one block of SW Montgomery St in downtown Portland into an EV charging island. There are 8 charging stations there including 2 DCFC stations. As you can see in the image below, the western part of the state is covered in EV charging infrastructure. And if you do happen to find yourself with a depleted battery without an outlet in sight, AAA of Oregon now offers roadside charging service. 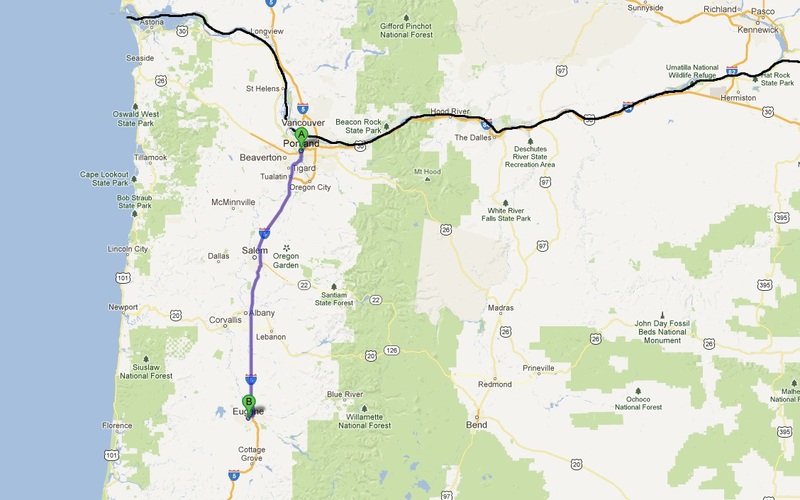 Along Interstate 5, it's just over 100 miles from Portland to Eugene. If you were to draw a 25 mile radius around this stretch of I-5, the resulting irregular obround shape would encompass the majority of the state's population. This area would include Portland and all of its suburbs from Hillsboro to Gresham and Vancouver WA to Tigard. It also captures all of the northern Oregon cities that line I-5, including Wilsonville, the capital (Salem), Albany, and, let's not forget the home of the Simpsons, Springfield, to name a few. This population clustering is, in part due to urban planning to prevent sprawl and it means that most vehicle trips are within this region and are less than 100 miles. This is one reason that Oregonians drive less than the national average. Given the distances that EVs such as the Nissan Leaf can travel today on a single charge, population clustering means that most people in this region can do all of their day's driving on a single charge. 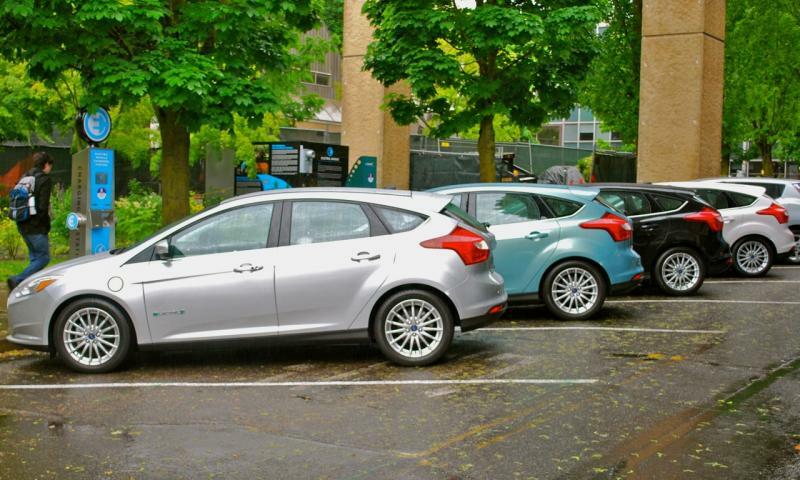 If you occasionally need a gas car, then Zipcar, Car2Go, and Getaround car sharing are all available in Portland. And cars are just part of Oregon's transportation services. 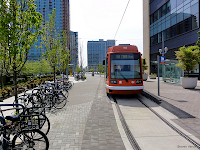 Portland is bike friendly and has light rail and streetcars. There are passenger trains that travel from Portland to Corvallis and Seattle. Rather than driving these routes, you can relax in a dining car with Wi-Fi service and when you arrive just rent a car, use a car share program, or take a cab. Hertz, Enterprise and others now offers EVs in their regional fleets. Having more transportation options means there are alternatives for trips where an EV may not be practical. This population clustering is also beneficial to the automakers. To launch a new vehicle program in Oregon, only a few dealers need to enabled. For a program such as a new EV that requires charging infrastructure, new diagnostic tools, and a lot of training, it can be a massive effort and expense to roll this out in a large market. 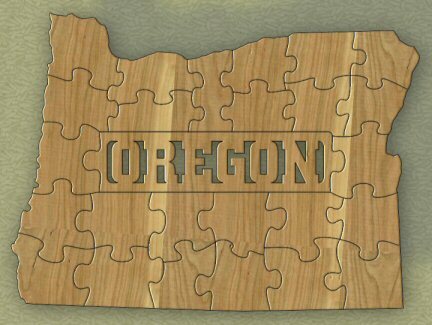 The population geography of Oregon makes it a great test market. When you think about electric vehicle regions in the US, you most likely think of California. California has had infamous smog problems that lead them to create their own vehicle emissions standards and form an Air Resources Board. This board created the Zero Emission Mandate that requires a small and growing portion of the vehicles sold in the state to have no tailpipe. Given the current cost and complexity of hydrogen fuel cell vehicles, the easiest way for vehicle manufacturers to meet this mandate is with battery electric vehicle. California's neighbor to the north may not be a one of the first places that you associate with electric vehicles (EV), but a unique combination of factors have all converged in Oregon to make a great place for EVs to take root. Oregonians are embracing plug-in vehicles (PEV) at a rate that is more than twice the national average. March PEV sales broke records nationally and Oregon was one of the highest. In the same month, the Nissan Leaf outsold all other Nissan vehicles at Portland Nissan dealerships. In Portland, more Leafs were sold than Altimas, Jukes, GT-Rs or any other vehicle that Nissan sells. Northwest dealerships are finding it difficult to keep the vehicles in stock. An Edmunds.com analysis from 2012 shows that Oregon accounts for less than 1% of all new vehicle sales, yet is responsible for 1.9% of all new hybrid vehicle sales and 1.8% of all EV sales. Oregonians prefer to buy efficient vehicles at more than twice the national average. Edmunds goes on to say "Oregon has been chosen as one of the first test markets for virtually every new electric vehicle introduced in the United States." 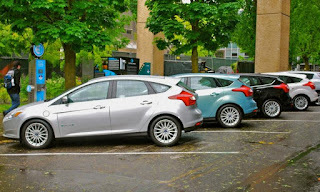 What is it that makes plug-in vehicles so popular in Oregon? Over the next few days, we'll explore the ethos, weather, energy, economy, and several of the reasons that make EVs perfect for Oregon. 2013 Nissan Leaf review: Top-selling electric car defies expectations - NY Daily News: "What's the top selling electric car of all time? The Nissan Leaf has sold more than 50,000 cars globally, making it the fastest- and best-selling electric vehicle ever produced. Nissan continues to upgrade the vehicle, seeking to add more mileage to its battery and reduce charging time. The Nissan Leaf has a starting price of $21,300 after federal tax savings."